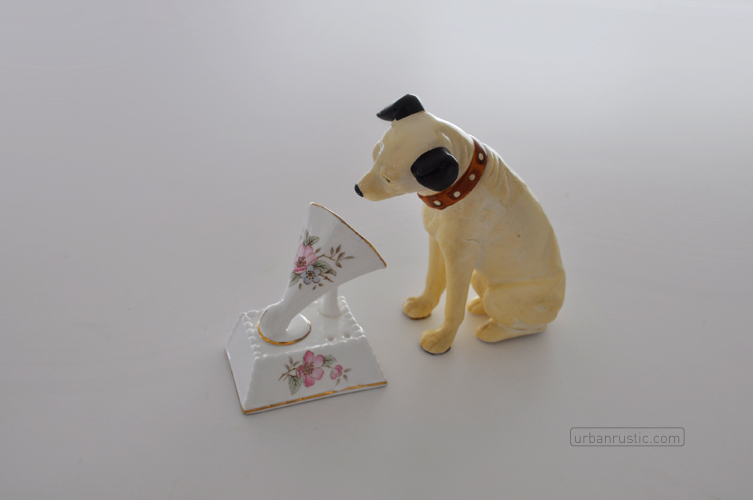 A loud shoutout to the very lovely re:retro for so generously donating Nipper to the urban rustic collection. How sweet is he, loving that fine bone Gramma-phone? So here I am recreating logo’s in 3D. Not such a technophobe emi? These days my version of 3 dimensions is photographing props. And it sounds pretty good to me. What do you think? Cheers Edwina. I appreciate your generosity so much. mitchell road is great…and thanks for the bakelite dice finds. next time you go to mitchell road let me know and i’ll meet you there. i’m just around the corner. I’d really like to do that Edwina. And I’m dead keen to go back. Maybe in a week or so, are you free during weekdays? Awesome, thanks again Edwina. Old dogs rule! sandy, i am free now school’s gone back, and on weekdays- you have my mobile no.- let’s meet at mitchell rd for some vintage sightseeing/shopping. So sweet, you lucky lucky person!